There’s little doubt that Buddhism originated from the northern India. Presence of many Buddhist temples and monuments imitating Buddha are plenty in northern India. But as history has it, it started to disappear gradually in the place of its origin giving way towards other religions, of course there were other religions then, but the point here is that now the Buddhism has shifted its prominence and circle way towards the east of its birth place. However, for faith has no boundary and the fact that religion actually travels within any soul, and in today’s free world, it’s nothing surprising to see the temple with the statues of a god that you are an ardent follower of sitting on the a place quite near to you even though you live in a society that practices other religion. 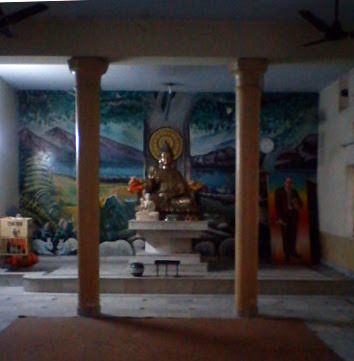 Near the Sikh Gurudwara, there is a small temple with one big statue of a Buddha and a small one sitting beside it. It’s basically empty unlike our temples in Bhutan. I have visited number of temples, and even Synagogue. There is this common character with it. The space where one comes to realize god and worship Him is basically an empty space unlike ours where it is filled with religious sects and gold plated statues. I was in Lotus Temple, the temple which is popularly called as Bah Haus Temple, a place where every religion of the world is respected and worshipped. It has a huge empty shell with people maintaining silence for few minutes. Perhaps that’s the difference between our cultures and there’s. We love in making noises, our way of shoeing the dog and the devil is almost same; stone it away or chase it away. Anyway, coming to this temple near my hostel, I have known it since few months in Delhi during my first year. And since then, I visit it whenever I want. There’s no occasion for it. If it was in Bhutan, I would have definitely been in monasteries and temples mostly during some holy-days, but here in India, it is kind of a thought that keeps me reminding or rooting me back towards the fear of death and the need for saying prayers for the welfare of people I love and care. And with so many things happening in Delhi, I kind of seek God’s Blessing and guidance to keep me safe and sound. And simple prostration and few words of prayers make my whole bunch of days where I lost into the world of ephemeral materialism.